The Big Horn Mountains are part of the Rocky Mountain chain. Cloud Peak (13, 175 ft: 4,050 m)in the middle of the Cloud Peak Wilderness, is the highest point in the range. 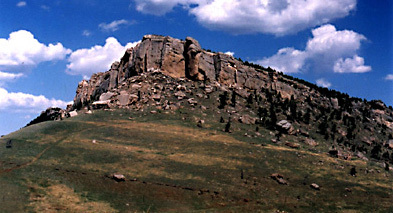 Prominant rock formation that resembles a steamboat prow. U.S. 14 bends around the base of the point on its way up the mountain. Easily accessible from highway 14, Sibley Lake is a beautiful mountain lake. You can fish, picnic or just try to catch the frogs in the wet lands by the lake. The picnic grounds along the north fork of the Tongue River is a nice place to have your lunch while you are touring the Big Horns. The picinc grounds have tables, fire rings and bathrooms available. The Forest Service has an interpretive center and overlooks for viewing Shell Falls along side U.S. 14. 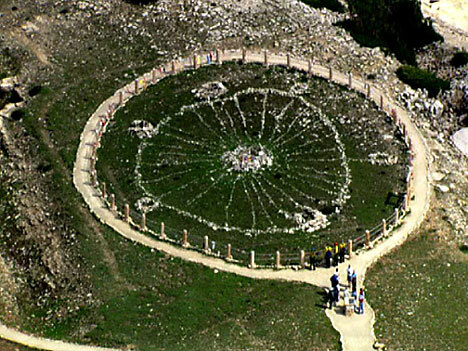 The center is a nice place to stop and stretch your legs during a trip over the Big Horns. There is a nature walk along the cliff above the mini-canyon carved by Shell Creek. Vistas of Devils Canyon and the Bucking Mule Falls reached on a 3 mile hike on a well maintained level trail. You continue on an extended hike down and through the Devil's Canyon for a two day trip. 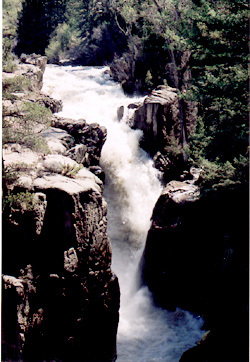 The trail down to Porcupine Falls is steeper and rougher than the Bucking Mule Trail. However, it is worth the work. At the bottom of the trail is the pool formed by Bald Mountain Creek. Gold miners packed a dredge down to the pool in their search for gold. You can still see some of the old equipment. Bring your lunch and a swimsuit for a fun afternoon! Unique archeological site of stone on US 14A found on a mesa overlooking a wonderful view of the Bighorn Basin. Who built the site is still not known.